Take the 91 west exit Tustin make a left go down a ½ mile to Lincoln Ave., turn right on Lincoln Ave., then turn right on Palm, left on Main. We are the brown glass two-story building on left hand side. 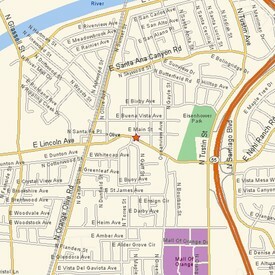 Go North on the 55 exit Lincoln/Knoll Ranch make a left on Santiago, turn left on Lincoln Av., go to Palm make a right, then turn left on Main. We are the brown glass two-story building on left hand side. Go south on the 5 to the 91 east exit Glassel! Make a right go a ¼ of a mile, make a left on Lincoln Ave., go to Palm make a left, then turn left on Main. We are the brown glass two-story building on left hand side.